Crude prices are down this morning to $46.54, 38 cents off from yesterday’s close. Like most days this week, prices yesterday saw a midday peak, followed by declining prices. Prices opened at $46.91 this morning, almost 20 cents down from yesterday’s opening price. Refined products are down as well this morning. Diesel prices are $1.5265, having lost 1.7 cents (1.1%) since opening this morning. Gasoline prices are down 2.3 cents (1.4%) to $1.5834, falling slowly at first before falling faster than crude or diesel. With no major reports coming out on Thursdays, news has been light this morning. Markets have lost their enthusiasm from earlier this week, with markets down slightly on profit-taking. 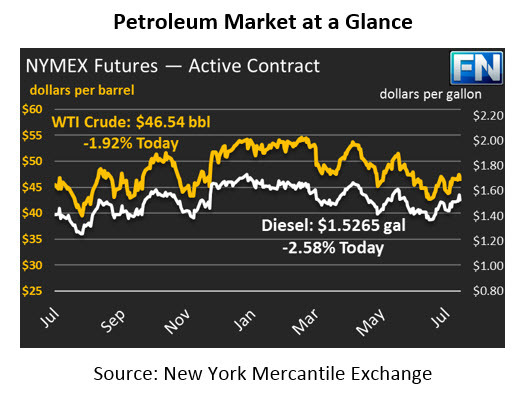 Despite the steep drop in the dollar yesterday (a full 1% decline), oil markets are still trading lower. Markets will likely remain in a holding pattern today, waiting for more concrete news about the OPEC/NOPEC meeting occurring Saturday-Monday. Market expectations foresee Saudi Arabia and Russia pushing the group to maintain current cuts, rather than deepening the cuts. In the past, OPCE has used meetings to generate market hype, followed by a steep drop following an uneventful meeting. Perhaps this time they are keeping expectations low heading into the meeting, followed by a surprise bullish announcement, as they did in November 2016 when they announced the cuts. We’ll find out what their plans are soon enough. California gasoline buyers are being hit this morning by contaminated fuel that does not meet California’s unique CARB specifications. Reports have shared that nearly 1 million barrels of gasoline in California have been affected by the off-spec gasoline. LA Basis, the difference between fuel delivered to NY Harbor and fuel delivered to Los Angeles, has jumped 4.5 cents this morning to 8.5 cents over the NYMEX, and could rise higher as the extent of the damage is uncovered.